A fundraising drive will now take place to raise funds to preserve the tower. 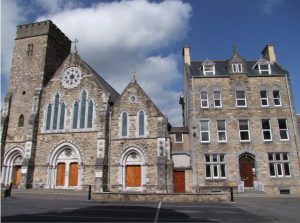 A historic church in Clonmel in County Tipperary where a wall was extensively damaged last summer has provided a unique insight into the town’s history. Last summer, plaster fell off the wall of Clonmel Friary. Subsequent tests revealed that the structure underneath was the original wall of the tower, which was constructed between 1350 and 1400. Following professional advice, it has since been decided that this section will not be re-plastered, and the original wall will be left visible in the Friary, which is believed to be the oldest building in Clonmel. Fr Mulligan revealed that a fundraising drive is now taking place in Clonmel to fund works necessary to preserve the tower in its original form. The original friary church in Abbey Street in Clonmel was built in 1269. This building had a turbulent history. The Franciscan community was dispersed, moving to other locations in the town after the monastery was seized during the Suppression on 8 March 1540. The move followed King Henry VIII’s plan announced in 1536 for the dissolution of the Irish monasteries to raise money for the state. The Franciscans returned to Abbey Street in the 1800s.